Visual Studio Code>Programming Languages>Rainbow CSVNew to Visual Studio Code? Get it now. Highlight columns in comma (.csv), tab (.tsv), semicolon and pipe - separated files in different colors. Provide info about column on mouse hover. Automatic consistency check for csv files (CSVLint). Another way to do this: select one separator character with mouse cursor -> right click -> "Set as Rainbow separator"
Rainbow CSV will run spreadsheet autodetection algorithm for all "Plain Text" files. In most cases this is a very cheap operation because autodetection would stop after checking only 1-2 topmost lines. To disable autodetection for the current file press "Rainbow OFF" button inside the status line. You can adjust autodetection parameters or disable it in Rainbow CSV extension settings section. To disable automatic CSV Linting set "rainbow_csv.enable_auto_csv_lint": false in "Rainbow CSV" section of VS Code settings. To recheck a csv file click on "CSVLint" button. To enable Rainbow CSV for very big files (more than 300K lines or 20MB) disable "Editor:Large File Optimizations" option in VS Code settings. You can preview huge files by clicking "Preview... " option in VS Code File Explorer context menu. All Rainbow CSV features would be disabled by VSCode if file is bigger than 50MB. 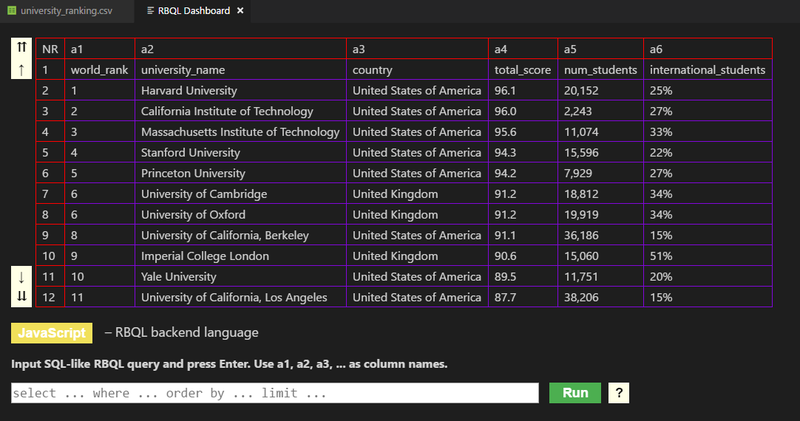 Enter RBQL - SQL-like language query editing mode. Activate multi-cursor column editing for column under the cursor. Works only for files with less than 10000 lines. For larger files you can use an RBQL query. WARNING: This is a dangerous mode. It is possible to accidentally corrupt table structure by incorrectly using "Backspace" or entering separator or double quote characters. Use RBQL if you are not sure. To remove cursor/selection from the header line use "Alt+Click" on it. Adjust column names displayed in hover tooltips. Actual header line and file content won't be affected. Rainbow CSV always assumes the first row as a header, so when there is no real header in a spreadsheet, you can use this command and provide comma-separated string with column names to create a "virtual" header for more comfortable data viewing. Accepted CSV format doesn't require you to customize all of the columns - this is useful when you want to name only some small subset of available columns. Note that you must provide comma-separated string no matter what separator is actually used in your spreadsheet file. "Virtual" header is persistent and will be associated with the parent file across VSCode sessions. Rainbow CSV has built-in RBQL query language interpreter that allows you to run SQL-like queries using a1, a2, a3, ... column names. To enter query-editing mode, execute RBQL VSCode command. RBQL is a very simple and powerful tool which would allow you to quickly and easily perform most common data-manipulation tasks and convert your csv tables to bash scripts, single-lines json, single-line xml files, etc. You can use RBQL command for all possible types of files (e.g. .js, .xml, .html), but for non-table files only two variables: NR and a1 would be available. Unlike Rainbow CSV, which always treats first line as header, RBQL is header-agnostic i.e. it never treats first line as header, so to skip over header line add WHERE NR > 1 to your query. 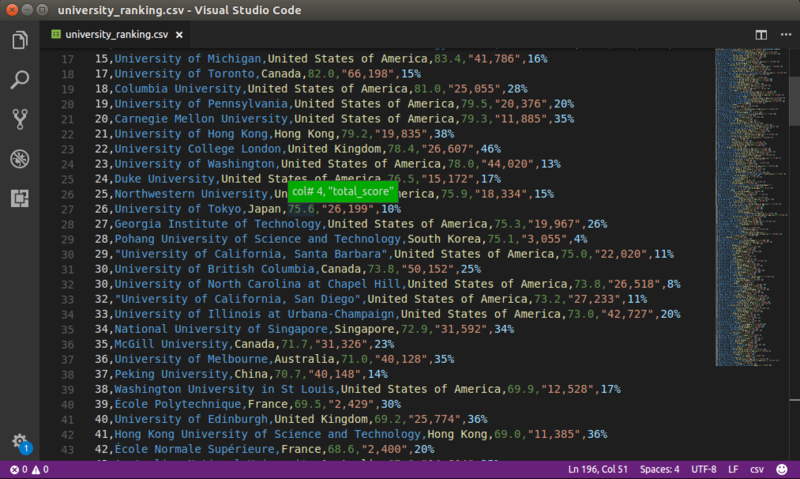 High information density: Rainbow CSV shows more data per screen because it doesn't insert column-aligning whitespaces. Rainbow CSV may be less effective for CSV files with many (> 10) columns.